I’ve never quite understood why people don’t like their vegetables. Vegetables are the mainstay of great health! If you aren’t a veggie eater, consider adding delicious vegetables to your eating plan – they are so good and so good for you. A recent study found including 8-10 servings of vegetables and fruit per day is effective at reducing blood pressure! Eat your medicine! Vegetables contain SO many good-for-you vitamins and nutrients – they are a powerhouse of good nutrition. I’m not so concerned by how you eat your veggies, just that you eat them! I prefer fresh, and raw or lightly steamed, but frozen is okay, too. Canned vegetables usually have their life cooked out of them, but if you need to use an occasional can of green beans or corn – go for it! Brussel sprouts. Yep – love ‘em! Restaurants have turned us on to this delicious and healthful veggie. They are actually tiny cruciferous cabbages, and they are from Brussels, Belgium. 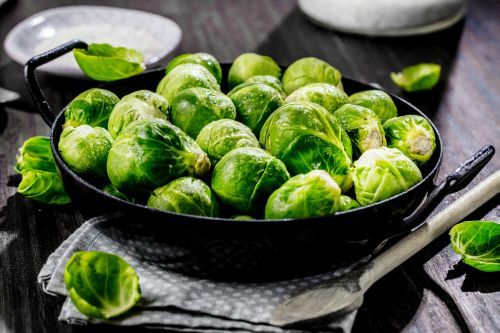 Cabbages are chock full of anti-cancer nutrients – possibly more than any other vegetable group, and a good source of vitamin K, potassium, and folic acid. Especially purple cabbage. I normally eat it raw, but it is a great roasted veggie as a “steak.” Cabbages contain lots of flavonoids, antioxidants and are a good source of calcium, magnesium and potassium, plus vitamins C and K, and lutein and zeaxanthin – good for your eyes! Beets are not only beautiful in color, they are beautiful to your body – especially your liver and heart. Beets have lots of potassium and folate. They can be steamed, roasted, eaten raw, and thrown into a smoothie to make it not only healthy, but look pretty, too. Sweet potatoes (and white potatoes, for that matter). Potatoes get a bad rap, and they aren’t the most nutritious vegetable. But sometimes I love a potato baked with sea salt on its skin, and I add lots of good, organic butter! Yummy! Sweet potatoes, containing vitamin A and C, potassium, and a little calcium are more of a powerhouse, and they are delish, too. I like them baked, with that same organic butter, cinnamon, nutmeg and ginger. Spaghetti Squash – lots of fiber here, and vitamin A, potassium and iron. Spaghetti squash is one of the least intimidating winter squashes. It is easy to carve open and roasts quickly. I like to add my favorite spaghetti squash, or even just butter and/or olive oil, and eat it right out of the oven (almost….). I could go on and on: Asparagus, mushrooms, corn, carrots, celery, peas, green leafy veggies, broccoli, etc. etc. The important thing to keep in mind is that vegetables cause no harm. So, if you aren’t a veggie eater, think about adding just one to your eating plan this week, and then maybe a new one next week, and so on. You might surprise yourself!